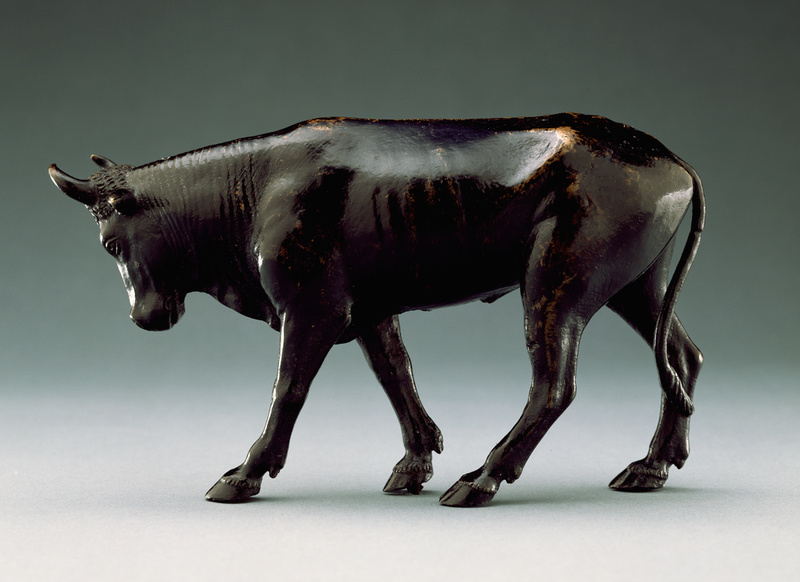 This small bronze bull hangs his tail in a gentle S-curve, slowly ambling forward with lowered head. Concentrating on capturing the bull's heft and delicacy at the same time, the artist cast an animal both strong and graceful, with thick hide and curls and smooth hooves edged in a ruffled line of hair. Bulls were among the favorite animals for small-scale bronze reproductions in the Renaissance, when patrons and artists alike turned to antiquity for their models. 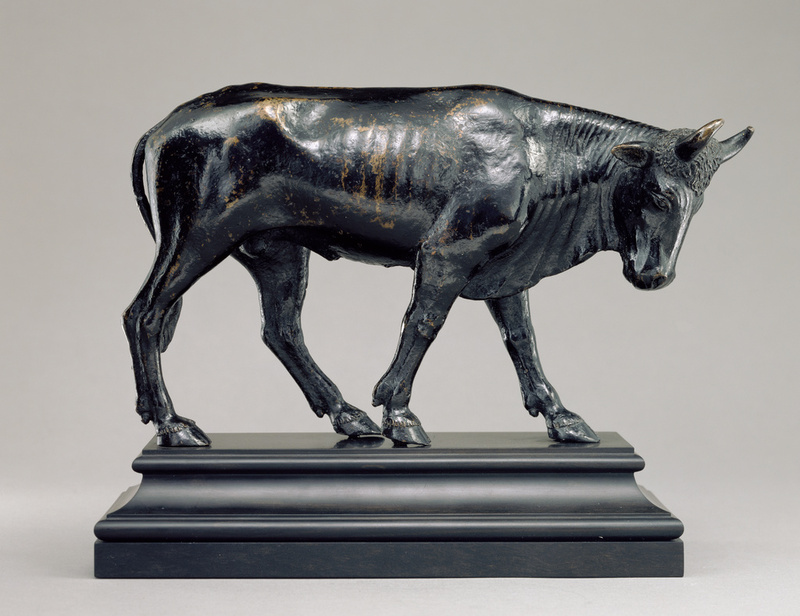 Not only is the bronze material closely associated with antique statuettes, but ancient bronze bulls were well known in the Renaissance because of their frequent survival as votive statues. This bull corresponds closely to the antique type of docile bull. Like these statues, he is represented as having a gentle disposition, neatly cloven hooves, a clump of hair between his horns, and a dewlap--a loose fold of skin at the neck--that falls on both sides of his head. The Getty Museum's bull is one of the earliest and finest of the surviving examples of this type. Dr. Franz Kieslinger (Vienna, Austria), sold to August Lederer. August Lederer, 1857 - 1936 (Vienna, Austria), by inheritance to his widow, Serena Lederer. Serena Lederer, 1867 - 1943 (Vienna, Austria), possibly confiscated by the Gestapo (at the direction of the Zentralstelle für Denkmalscuhtz), per the order of the Wiener Magistrat, Magistratsabteilung 2, dated November 26, 1938.
? In the possession of the Nazis, presumably recovered by the Allied Forces.
? In custody of the Allied Forces, released to the Republic of Austria.
? Austrian government, restituted to the son of Serena Lederer, Erich Lederer. Planiscig, Leo. Venezianische Bildhauer der Renaissance (Vienna: A. Schroll & Co, 1921), p. 591. "Acquisitions/1985." The J. Paul Getty Museum Journal 14 (1986), p. 260, no. 239, ill.
Fusco, Peter. Summary Catalogue of European Sculpture in the J. Paul Getty Museum (Los Angeles: J. Paul Getty Museum, 1997), p. 67, ill.
Fogelman, Peggy, and Peter Fusco, with Marietta Cambareri. Italian and Spanish Sculpture: Catalogue of the J. Paul Getty Museum (Los Angeles: J. Paul Getty Museum, 2002), pp. 12-15, no. 2, pp. 360-61. Fogelman, Peggy, and Peter Fusco, with Marietta Cambareri. Italian and Spanish Sculpture: Catalogue of the J. Paul Getty Museum Collection (Los Angeles: J. Paul Getty Museum, 2002), pp. 12-15, ills. 2-2B.